You might expect that a blog about Rome in the rain might provide useful information on indoor activities to enjoy in the Italian capital. If you have somehow stumbled upon this blog whilst looking for such information then you would, I’m sorry to say, be bitterly disappointed: Phil and I are far too cheap to pay for entrance fees (especially Italian entrance fees which are shocking in comparison to Andalucían entrance fees!). 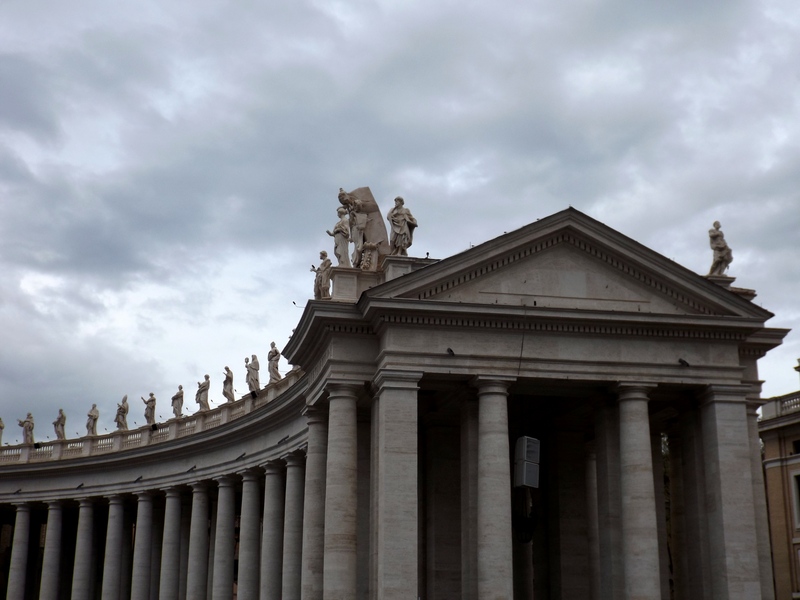 Hence, for the most part, we braved the rain and wandered around enjoying Rome’s many sights from the outside only. Italians seem to be known for their maniacal way of driving, and our first passenger experience – in a shuttle to our hostel from the airport – seemed to confirm this: the first motorway we got onto had three lanes but the cars were breezily drifting from one to the other, and after a few hundred metres the road markings simply disappeared, as though the road itself accepted the futility of trying to mark out separate lanes. Halfway through the journey our driver got his phone out and proceeded to text and drive for the next 10 minutes. More worrying than this, however, was that at one point he got out a pair of glasses which he wore for the rest of the journey: whether he needed these for the driving or the texting I could not say. 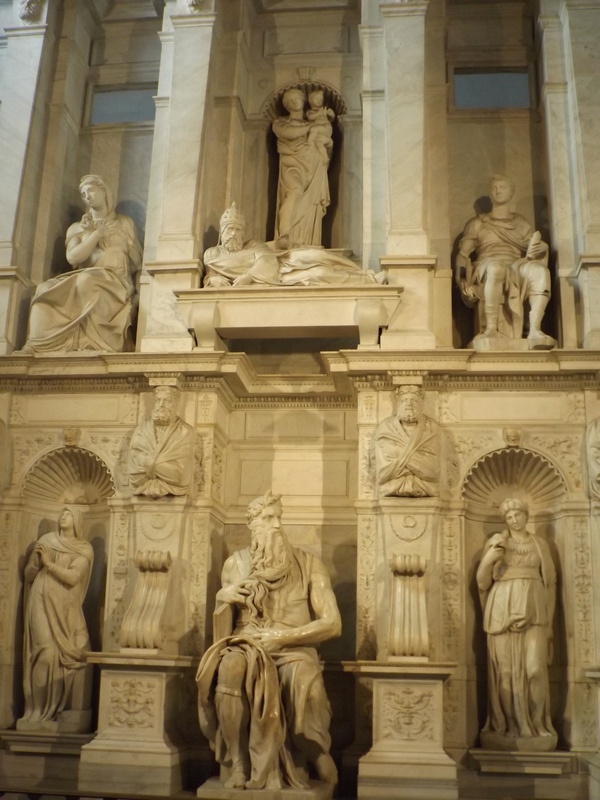 We’d only planned on having one full day in Rome, so we spent Sunday – which turned out to be Easter Sunday much to our surprise – traversing through the centre of the city, taking in as many sights as possible. Our first destination was the Colosseum which I’d been dying to see for many years since my first trip to Rome as an 18-year-old (at that time my friend and I had held the Colosseum off as a treat for our final day, but due to an extreme hangover – I’m sure vodka in Italy is a lot more extreme than in the UK – I ended up spending the day cowering in my bed and hiding from the world). The biggest amphitheatre in the world, the Colosseum’s construction began around 72 AD under the Flavian emperor Vespasian and was completed in 80 AD by his son and heir, Titus, who marked the opening with 100 days of gladiatorial games. Such games were popular among the people and thus were a good way for emperors to appease their citizens; the location of the amphitheatre, on what was originally Nero’s private lake, was strategic in garnering support for the new Flavian dynasty as it returned to the people some of the land taken by the tyrannical emperor. Long queues seem to be a constant theme in Italian cities, and Phil and I didn’t want to spare the time or the money to go inside the Colosseum. However, we did brave the throng of tourists milling around and queuing around the Colosseum and nearby Roman Forum in order to get a better look at the excellent Arch of Constantine. Twenty-one metres high and 26 metres wide, the triumphal arch was built to commemorate Constantine’s victory at the Battle of Milvian Bridge in 312. 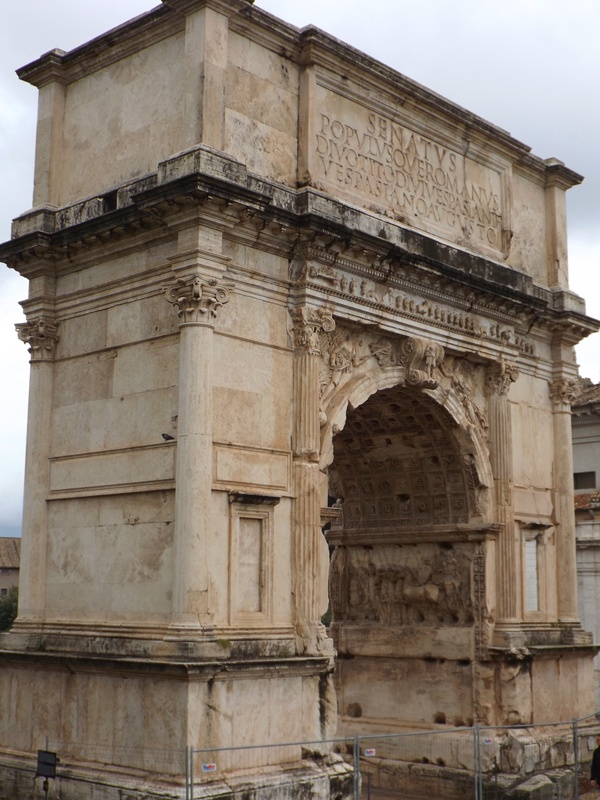 The nearby Arch of Titus is smaller at around 15 metres in height but is even older; built in 81-85 AD, it commemorates Titus’s capture of Jerusalem in 70 AD. From the Colosseum we made our way through the city, taking in sights such as the Monumento Nazionale a Vittorio Emanuele II, a huge and dominating monument built in white marble and sometimes referred to as the ‘wedding cake’, which holds the Tomb of the Unknown Soldier, and the Church of Saint Peter in Chains, which contains Michelangelo’s excellent Moses sculpture. 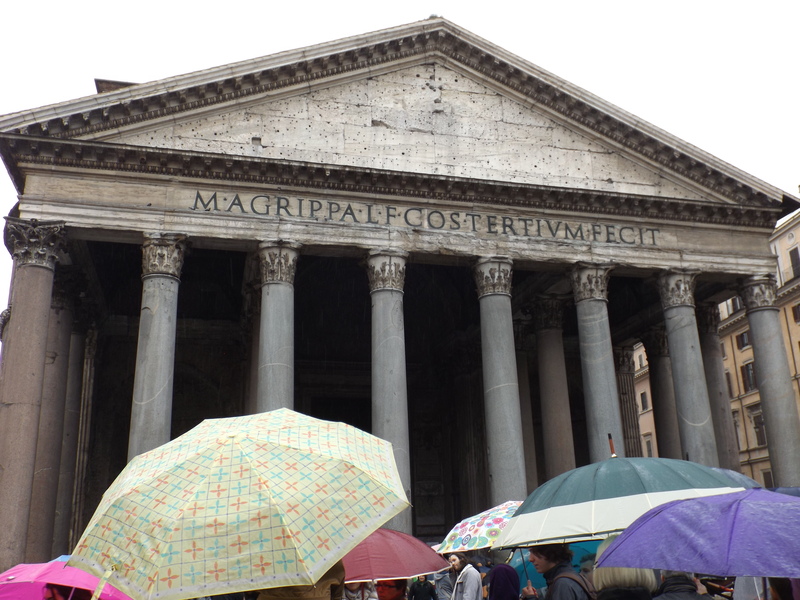 I’d been desperate to see the Pantheon again as it was one of the highlights from my first trip to the city. The contrast between my first visit in the heat and sunshine of July to Phil and I’s day out in the dreary rain was a stark one. Regardless, the Pantheon, rebuilt around 126 AD by emperor Hadrian after the original temple was burnt down, remains an extremely impressive sight from outside, being as it is one of the best preserved buildings of ancient Rome, while the interior is worth a look too. It has been in constant use since its construction, and as a church since the 7th century, something which was drilled home to us and the noisy and heaving crowd of tourists by a lady who came over the tannoy to request that everyone be quiet and respectful in the religious building. The Trevi Fountain is another of Rome’s many wonders; unfortunately it was under construction when Phil and I visited, so its normally grand and regal look was hindered by scaffolding and glass panels which encased the baroque 26-metre-high fountain. One of the great and perhaps somewhat surprising things about Rome is the ability to see so much of the city on foot: from the Trevi Fountain it is a short walk to the picturesque Piazza Navona, which provides further examples of Roman baroque architecture; flanked by beautiful buildings including the church of Sant’Agnese in Agone the plaza is filled with impressive fountains (as well as, admittedly, a crowd of tourists). Although the Vatican is further away, it is still easily reachable and just requires a walk across the pedestrian, sculpture-lined bridge, Ponte Sant-Angelo. 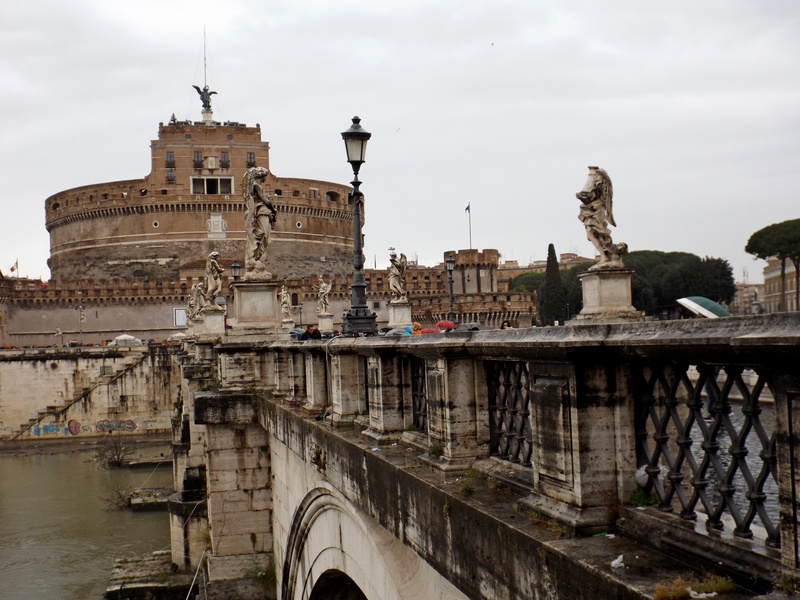 The bridge is a sight on its own, but its position provides a lovely view of the city, including both St Peter’s Basilica and the Castel Sant-Angelo. On the busy and rainy Easter weekend, of course, the streets were pretty crowded and required a lot of careful umbrella-avoiding, but we made it there unscathed. 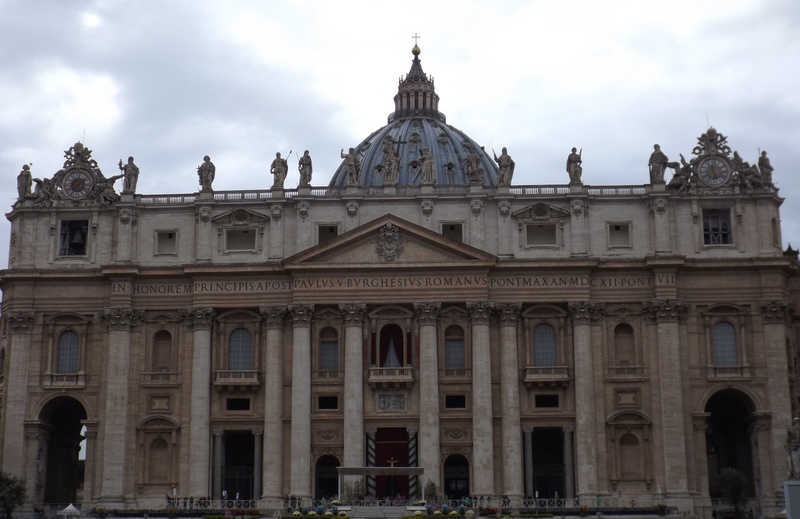 We had no intentions of queuing for hours to get into the Vatican, but St Peter’s Basilica is a wonderful sight and St Peter’s square is huge enough that you can easily wander around taking it all in without feeling like part of a herd. We woke up early the next day and made our way to the bus station for our bus to Le Marche, where we were spending a couple of weeks with our next Workaway hosts. Unfortunately for us, the Italian public transport system had other plans, or rather, no particular plans to adhere to its own timetable. After spending an hour by the side of the road (the ‘bus station’ for this particularly bus company – Start Spa), we decided to accept the fact that the bus driver probably just didn’t fancy coming into work that day. With no other transportation options to the part of Le Marche which we were heading to, we found ourselves in Rome for another night, forking out an outrageous amount of money for a room in a nearby hostel. Despite the wasted time and money, this did give us another day to check out some of the sights in Rome which wouldn’t fit onto a very rushed itinerary: the Quattro Fontane (Four Fountains), found at the intersection of two large roads, is an interesting and somewhat unexpected sight, and the nearby baroque church San Carlo alle Quattro Fontane is pretty too. On our unplanned morning wandering around Rome we also stumbled across a couple of small parks, which was something of a relief as we’d previously commented on the seeming lack of green spaces in the city. Thankfully the bus on Tuesday 7th April was indeed running and we made our way through Rieti and the mountainous terrain of Le Marche to a little village called Comunanza. All that and more to look forward to on the next blog – aren’t you lucky. Thanks again for reading!